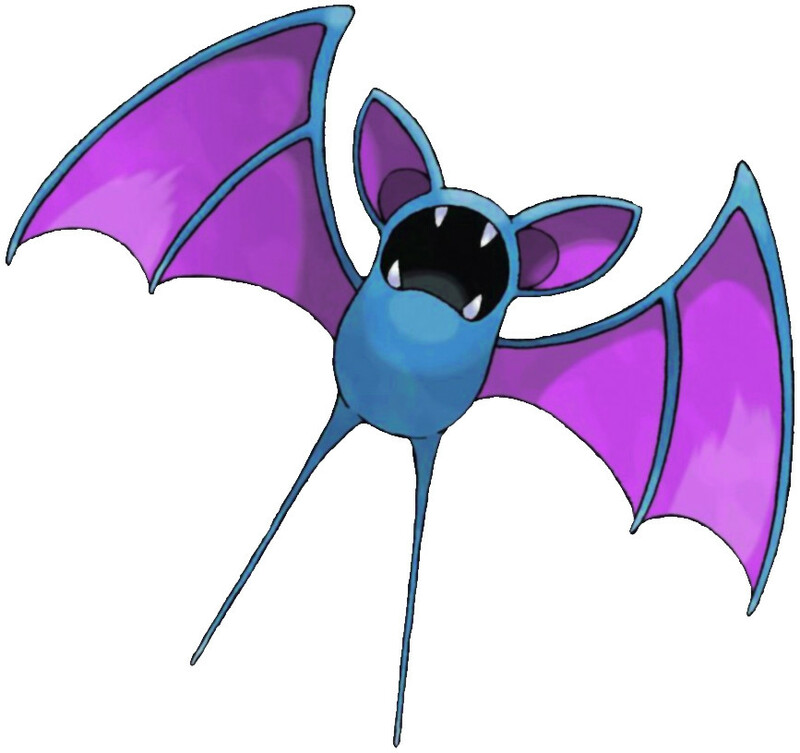 Zubat is a Poison/Flying type Pokémon introduced in Generation 1. It is known as the Bat Pokémon . The effectiveness of each type on Zubat. In Generation 1, Zubat has a base Special stat of 40. In Generations 1-4, Zubat has a base experience yield of 54. Forms colonies in perpetually dark places. Uses ultrasonic waves to identify and approach targets. Emits ultrasonic cries while it flies. They act as a sonar used to check for objects in its way. While flying, it constantly emits ultrasonic waves from its mouth to check its surroundings. Capable of flying safely in dark places, it emits ultrasonic cries to check for any obstacles. During the day, it gathers with others and hangs from the ceilings of old buildings and caves. ZUBAT remains quietly unmoving in a dark spot during the bright daylight hours. It does so because prolonged exposure to the sun causes its body to become slightly burned. ZUBAT avoids sunlight because exposure causes it to become unhealthy. During the daytime, it stays in caves or under the eaves of old houses, sleeping while hanging upside down. It has no eyes. Instead, it relies on its ultrasonic cries for echo location to flit about in darkness. It forms colonies in perpetually dark places and uses ultrasonic waves to identify and approach targets. While living in pitch-black caverns, their eyes gradually grew shut and deprived them of vision. They use ultrasonic waves to detect obstacles. Even though it has no eyes, it can sense obstacles using ultrasonic waves it emits from its mouth. Disliking sunlight, it sleeps deep in forests and caves until sundown. It checks its surroundings and location using reflections of the ultrasonic waves from its mouth. It does not need eyes, because it emits ultrasonic waves to check its surroundings while it flies. It has no eyes. Instead, it relies on its ultrasonic cries for echolocation to flit about in darkness. It sleeps in caves during the day. It has no eyes, so to check its surroundings while flying, it emits ultrasonic waves. When exposed to sunlight, they suffer burns. The frequency of their ultrasonic waves can differ slightly from colony to colony. It has no eyeballs, so it can’t see. It checks its surroundings via the ultrasonic waves it emits from its mouth. Their skin is so thin that they’ll be burned if sunlight hits them. When it gets cold out, they gather together to warm one another’s bodies. Zubat learns the following moves in Pokémon Let's Go Pikachu & Let's Go Eevee at the levels specified. Zubat learns the following moves in Pokémon Ultra Sun & Ultra Moon at the levels specified. Zubat learns the following moves via breeding in Pokémon Ultra Sun & Ultra Moon. Details and compatible parents can be found on the Zubat egg moves page. Zubat can only learn these moves in previous generations. It must be taught the moves in the appropriate game and then transferred to Pokémon Ultra Sun & Ultra Moon. Why did I see a green Zubat? Why is Leech Life Super Effective against Zubat in Gen. 1? Zubat vs Pidgey for flying Pokemon in Soulsilver?